Hierocles is an important Stoic figure of the second century, even though unfortunately nothing is known of his life. He is most famous for his Elements of Ethics, parts of which (about 300 lines) were uncovered in the form of a papyrus as recently as 1901. We also have other fragments from Hierocles, through the writings of Stobaeus. All of the fragments are collected in a handy little edition, based on the classical translation by Thomas Taylor (1882). Perusing them, one gets a sense of Hierocles’ thinking on a number of topics, including: how to conduct ourselves with respect to the gods, toward our country, toward our parents, and toward our kindred. He also writes about fraternal love, wedlock, and even economics. The overall picture that emerges is of a rather conservative thinker, certainly by modern times, and arguably even by the standards of his own time. Which is interesting to me for a number of reasons. First off, the accusation is often thrown around that the Stoics were not concerned with social and political issues, which is clearly not the case. We get a good picture of this from both the writings and the lives of most of the Stoics we know of, especially Seneca and Marcus, but Hierocles is a particularly good example. Second, the more I study Stoicism the more I’m convinced that it truly is a big tent, ideologically speaking, as it can accommodate a variety of views both on metaphysics/religion and on politics and social issues. Some of the stuff that the more Cynic-oriented of the Stoics (like Epictetus) were saying was pretty radical (e.g., treating women and slaves as human beings on par with everyone else), but we also have what I would characterize as Seneca’s more “mainstream” views, and finally the conservative end of the spectrum, well represented by Hierocles. The reason I am very comfortable with such variety — even though I myself am a progressive and an atheist — is that this is a predictable consequence of adopting a virtue ethical framework: virtue ethics does not provide specific guidance about individual issues or circumstances, but rather directs one to develop one’s character in a morally right way. And unless one is willing to demonize people of a different political persuasion (unfortunately, an all too common stance nowadays), one has to admit that there are people of good character among progressives, libertarians, conservatives, and what not. But as Stoics committed to “follow facts” (as Becker rephrases the ancient “follow nature”) and to bring reason to bear upon our problems (as Seneca puts it in De Tranquillitate Animi, X.4), we ought to be able to disagree and yet keep searching for common ground. In the remainder of this post I will simply select some illustrative quotes from Hierocles’ fragments, without comment, to give you an idea of the range of his positions. The whole (rather short) thing is well worth a reading for anyone interested in Stoicism. Such particulars, also, as the following, are to be previously assumed concerning the Gods, viz. that they are immutable and firm in their decrees; so that they never change the conception of what appeared to them to be fit from the beginning … For it is easy to infer, that if the Gods change their decisions, and omit to punish him whom they had designed to punish, the world can neither be beautifully nor justly governed; nor can any probable reason for [the necessity of] repentance be assigned … pestilence and drought, and besides these excessive rain, earthquakes, and everything of this kind, are for the most part produced through certain other more physical causes … the Gods are of themselves the causes of good. by Jupiter, our country is as it were a certain secondary God, and our first and greatest parent … to prefer it to our wife, children, and friends; and, in short, after the Gods, to all other things … he who wishes to save himself rather than his country, in addition to acting unlawfully, desires impossibilities. But he who prefers his country to himself is dear to divinity; and reasons fitly and firmly … that which is advantageous to the country is common to each of the parts of it; since the whole without the parts is nothing … It is likewise requisite that a citizen should observe the laws of his country as certain secondary Gods, and should render himself perfect conformably to their mandate. After speaking of the Gods and our country, what person deserves to be mentioned more than, or prior to our parents? … the only measure of gratitude towards them is a perpetual and unremitting promptitude to repay the benefits we have received from them … it may be justly said, that our performances are the deeds of our parents; through whom we likewise derived our existence … children should be persuaded that they dwell in their father’s house, as if they were certain ministers and priests in a temple, appointed and consecrated for this purpose by nature herself … With respect to the souls of our parents, we should, in the first place, procure for them hilarity; which will be especially obtained, if we are conversant with them by night and by day … if at any time they should act wrong, which frequently happens to be the case with many, and especially with those who have been educated in a more vulgar manner; they should be corrected indeed, yet not by Jupiter with reprehension, as we are accustomed to do to our inferiors or equals, but as it were, with exhortation … For admonitions, and especially if they are vehement, are grievous to those that are old. For it is a sane assertion, which every man will consider as evident. And it is this: Act by everyone, in the same manner as if you supposed yourself to be him, and him to be you … This, therefore, is the first admonition, that a man should act towards his brother in the same way in which he would think it proper that his brother should act towards him … In our behaviour, therefore, towards every man, and in a much greater degree towards a brother, we should imitate the reply of Socrates to one who said to him, “May I die unless I am revenged on you.” For his answer was, “May I die, if I do not make yon my friend” … No one, therefore, is alone, nor does he derive his origin from an oak or a rock, but from parents, and in conjunction with brothers, and kindred, and other familiars. the whole of our race is naturally adapted to society … cities could not exist without a household; but the household of an unmarried man is truly imperfect … a life accompanied by wedlock is to be precedaneously chosen by the wise man; but a single life is not to be chosen, except particular circumstances require it … Nature herself, prior to the wise man incites us to this, who also exhorts the wise man to marry. For she not only made us gregarious, but likewise adapted to copulation, and proposed the procreation of children and stability of life, as the one and common work of wedlock … In the first place, indeed, because it produces a truly divine fruit, the procreation of children, since they will be assistants to us in all our actions … I also think that a married life is beautiful. For what other thing can be such an ornament to a family, as is the association of husband and wife? … For there is not anything so troublesome which will not be easily borne by a husband and wife when they are concordant, and are willing to endure it in common … but when we marry those whom we ought not, and, together with this, are ourselves entirely ignorant of life, and unprepared to take a wife in such a way as a free and ingenuous woman ought to be taken, then it happens that this association with her becomes difficult and intolerable. 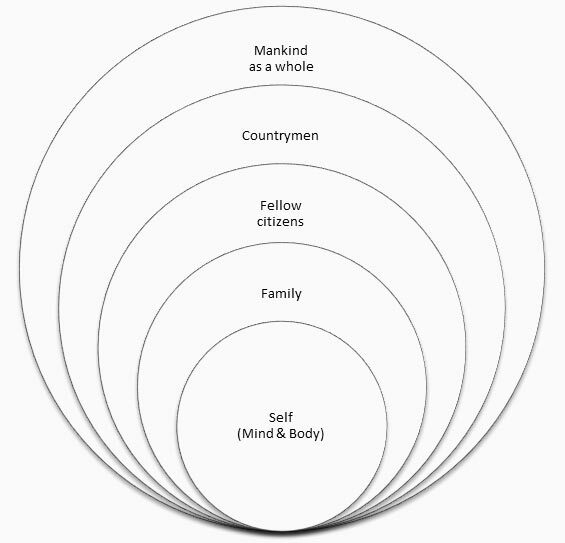 [this is the famous passage explaining the concept of the concentric circles of concern] each of us is, as it were, circumscribed by many circles; some of which are less, but others larger, and some comprehend, but others are comprehended, according to the different and unequal habitudes with respect to each other. For the first, indeed, and most proximate circle is that which everyone describes about his own mind as a centre, in which circle the body, and whatever is assumed for the sake of the body, are comprehended … The second from this, and which is at a greater distance from the centre, but comprehends the first circle, is that in which parents, brothers, wife, and children are arranged. The third circle from the centre is that which contains uncles and aunts, grandfathers and grandmothers, and the children of brothers and sisters … Next to this is that which contains the common people, then that which comprehends those of the same tribe, afterwards that which contains the citizens; and then two other circles follow, one being the circle of those that dwell in the vicinity of the city, and the other, of those of the same province. But the outermost and greatest circle, and which comprehends all the other circles, is that of the whole human race … it is the province of him who strives to conduct himself properly in each of these connections to collect, in a certain respect, the circles, as it were, to one centre, and always to endeavour earnestly to transfer himself from the comprehending circles to the several particulars which they comprehend. It is requisite, likewise, to add a proper measure conformably to the general use of appellations, calling indeed cousins, uncles and aunts, by the name of brothers, fathers and mothers; but of other kindred, to denominate some uncles, others the children of brothers or sisters, and others cousins, according to the difference of age, for the sake of the abundant extension which there is in names. For this mode of appellation will be no obscure indication of our sedulous attention to each of these relatives; and at the same time will incite, and extend us in a greater degree, to the contraction as it were of the above mentioned circles. Prior to all things, it is requisite to speak of the works through which the union of a family is preserved. These, therefore, are to be divided after the accustomed manner; viz. rural, forensic, and political works are to be attributed to the husband; but to the wife, such works as pertain to spinning wool, making of bread, cooking, and, in short, everything of a domestic nature. Nevertheless, it is not fit that the one should be entirely exempt from the works of the other … What, therefore, should hinder the man from partaking of the works which pertain to a woman, whose past life has been such as to free him from all suspicion of absurd and effeminate conduct? This entry was posted in Ancient Stoicism, Social living on January 12, 2016 by Massimo.